Please refer to this link on How to Import Using Quik for desktop​. If your camera is not being recognized on Quik for desktop, please refer to this article link. If you have an SD adapter for your MicroSD card, you can insert the MicroSD card into the adapter and insert the adapter into your computer. Press Windows Key+E to open File Explorer. Your SD card will be on the left sidebar under the "This PC" section. 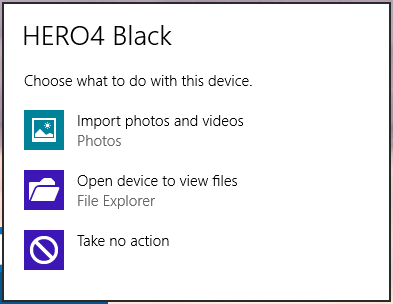 When connecting the camera to the computer you may be given an option to choose what happens when you connect the camera. If you do not see this prompt, move on to Method #4. If you want to set it up so that Auto Launch does occur, check out this article. If you choose to Import photos and videos, the Photos app will launch and give you the option to import your files. If you choose Open device to view files, File Explorer will launch. Double-click on your camera. Double-click on GoPro MTP Client Disc Volume. 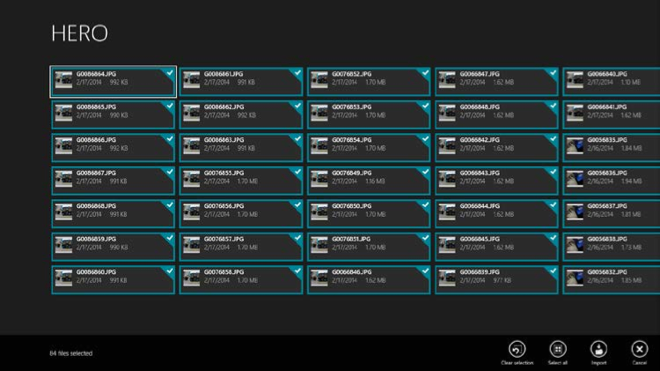 Open DCIM to access your GoPro folder. You can copy/paste your videos onto your computer's hard drive from here. Have any more questions or concerns? Hit us up HERE and we will be happy to help.